Cindy!!!! Yeah you won again. Boy Katie and Sandi are gonna be mad. Good job sis, catch you on the next one. Thanks to Jan for playing along. I hope you will keep playing. The challenges are so much fun and we learn stuff too. UMMMM, exccccuuuuuuuuse ME!!!! I clearly think this was rigged of nepotism....I don't see how Cinny could have beat ME with the challenge I put out there...hahaha!! Way to go Cinny...You rock, SISTAHHHH!!!! Not cool, Aunt Connie! I am outraged!!! I'm going to have to speak to my union delegate (who also happens to be Sandi) about this. Then, I'm going to write my congressman, and start a petition and maybe even picket the green gate... well, that sounds like alot of work, maybe not... Ok, I'll let you off this time, as long as you let me win your next challenge, ok??? 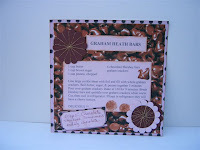 My recipe cards are DONE!